The chatter surrounding a trade of Pittsburgh Pirates outfielder Andrew McCutchen it growing to a fever pitch, with multiple outlets reporting it being almost a certainty now he will be moved during or before next week's Winter Meetings. This makes total sense of course when you consider McCutchen is being paid a ton, is coming off a career-worst season where his speed looked shot and his average sank, and the Pirates are well-stocked in young outfielders which includes Gregory Polanco, Starling Marte, and Austin Meadows. The Seattle Mariners, Texas Rangers, Toronto Blue Jays, and Washington Nationals are reportedly all involved in the McCutchen talks and of course in situations like this, where there is smoke there is fire. -Meanwhile the New York Mets are getting more calls on Curtis Granderson then Jay Bruce in terms of which lefty hitting outfielder they could move now that Yoenis Cespedes is back in the fold. Granderson makes a bit more than Bruce but the fact he has shown he can hit in a big market unlike Bruce makes him somewhat more attractive. The Mets will NOT deal either Michael Conforto or Juan Lagares on a related front. -Edwin Encarnacion's signing appears imminent, with the New York Yankees and Houston Astros the front-runners. The Toronto Blue Jays have seem resigned to letting Encarnacion walk after he rejected their last offer right before they inked Kendrys Morales. Also the Baltimore Orioles are still concentrating on Mark Trumbo and Carlos Beltran more than Encarnacion. -The Nationals seem likely to have a deal done before too long with closer Mark Melancon and the Los Angeles Dodgers will likely bring back Kenley Jansen. That leaves Aroldis Chapman headed back to the New York with the Yankees which has been the story all along. -Dexter Fowler is done in Chicago with the Cubs and could go to the Orioles a year after it appeared he was going to Baltimore in the first place. -The New York Mets keep waiting on their one-year offer to lefty reliever Jerry Blevins but the latter is looking for a two-year deal. -Once Encarnacion, the dominos will fall in terms of Beltran and Trumbo signing. The sophomore jinx was in full effect for New York Mets outfield prospect Michael Conforto last year, as the 2015 darling was nothing but a colossal bust once April was in the books. Having spent next-to-no-time in the minors after being selected by the Mets in the first round of the 2014 draft, the lack of seasoning on the farm became evident last season as opposing pitchers began to exploit the apparent holes in his swing. As a result, Conforto began to press like crazy and saw his K/9 rate skyrocket to a shoddy 25.6. A demotion to the minors soon ensued during the early summer and the season was pretty much a disaster despite being called back up in September. A .220 cumulative batting average was the end result for Conforto and now he has to try and push the bad memories of last season behind him. As far as 2017 is concerned, Conforto remains highly regarded in and around baseball due to his powerful swing and good patience at the dish. That will eventually translate to 20-plus home runs and a decent average but you have to wonder if the scars from 2016 will linger a bit into this season. Remember that Conforto doesn’t turn 24 until March and that means his vastly depressed draft price could make him a huge post-hype sleeper candidate. The New York Yankees are working to get free agent 1B/DH Edwin Encarnacion signed before the December Winter Meetings but they are meeting stiff competition from the Texas Rangers and Houston Astros. Internally the Yankees feel they need to upgrade the first base position and also would plan on having Encarnacion DH on certain days. Analysis: The Boston Red Sox and Toronto Blue Jays appear out at the moment on Encarnacion and so it could come down to a battle between the Yanks and Astros. The Rangers seem more interested in the cheaper cost on Carlos Beltran as their DH which would almost eliminate them as well. Encarnacion and his agent both have hinted they want to sign soon and so it looks like a resolution will come quickly with this. In one of the more strange statistical developments of the 2016 fantasy baseball season, New York Mets outfielder Curtis Granderson put forth a terrific power campaign by slugging 30 home runs for the NL wild card winners. You would think with all that power, Granderson would have been around at least 80 RBI as well. Didn't happen as the utter lack of protection in the injury-ravaged Met lineup prevented Granderson from collecting more than his 59 RBI. It was a staggering combination of numbers to say the least but Granderson did show that his home run swing is still in fine working order. In fact what Granderson did on the power front was doubly-impressive when you consider he operates in spacious Citi Field and had little protection around him in the lineup. Be that as it may, Granderson is pretty much just a home run asset at this late stage of his career (36 for 2017) and his .237 average last season is par for the course now on that front. Also Granderson's days of being a very good steals guy has been a thing of the past for awhile, with just 4 steals in 633 at-bats bearing this out. The home runs alone make Granderson an outfielder 3 for another year but backup status would be a better idea. Week 13 is the final regular season week in many fantasy football leagues and so let's see who makes for very good waiver adds as we head into the homestretch. Colin Kaepernick: I began telling you all to start picking up Kap two weeks ago and since becoming the San Francisco 49ers' starting QB, he has been quite good. The latest was a three-TD gem last week against the Miami Dolphins and he gets a very plush matchup this week versus the awful Chicago Bears defense. Yes please. Ryan Fitzpatrick: If you are hurting in two-QB formats, Fitzpatrick could be an option again as he comes off a good two-TD passing game versus the New England Patriots in Week 12. The Jets play the Indianapolis Colts this week which puts Fitzpatrick in position to attack a hideous defense. Kenneth Dixon: Things are changing in the Baltimore Ravens running back hierarchy as Kenneth Dixon got more touches than veteran Terrance West in Week 12 and he is the much more dynamic player both in the running and receiving game. Hope you picked him up last week when we told you to. Tyreek Hill: Well three touchdowns scored in three different ways (return, receiving, rushing) will put you squarely on the map in fantasy football and Hill will surely remain the focal point of the offense with tight end Travis Kelce going forward. Don't count on seeing wideout Jeremy Maclin returning just yet from his injured groin which will further increase Hill's potency. Marquess Wilson: With Alshon Jeffery suspended another two games, it is the speedy Marquess Wilson who is the number 1 receiver in the stripped-down Bears offese. He caught 8 passes in Week 12 and seems to have the trust of QB Matt Barkley. Malcolm Mitchell: There are always a bunch of mouth to feed in the New England Patriots passing offense but a second straight big week for Malcolm Mitchell makes him one to grab this week. The PPR potential here is decent and Mitchell is also becoming a red zone threat as he scored twice in Week 12. Taylor Gabriel: Matt Ryan is starting to like throwing deep to the speedy Gabriel and the two connected for two scores in Week 12. While Julio Jones remains the top dog by far in the Atlanta Falcons offense, Gabriel looks like he will retain deep-threat status. The New York Mets have Detroit Tigers outfieler J.D. Martinez on their backburner if they fail to bring back free agent outfielder Yoenis Cespedes over the next few weeks. The Tigers have made no secret about how available Martinez is and the Houston Astros and Washington Nationals have also been in touch there. Analysis: The Mets will also almost certainly move Jay Bruce in a trade if they re-sign Cespedes so there are a lot of potential moving parts here. Either way this is a story that could take center stage for next months' Winter Meetings. We have another Korean hitting riddle on our hands this season when it comes to 2017 fantasy baseball but this time it comes in the form of former failed MLB prospect Eric Thames. In 181 games with the Seattle Mariners and Toronto Blue Jays, Thomas hit a terrible .250 and showed little in the way of consistent power. He then proceeded to go to Korea and almost overnight turned into a mammoth slugger as Thames slammed a total of 124 home runs with a .348 average in three season in the Korean League and that helped him net the three-year deal worth $15 million guaranteed with the Milwaukee Brewers for 2017. Of course one has to wonder how much of those numbers will come back over to the States but at the age of 30, Thames is still young enough to retain some upside. As we often do in situations like this, it is best to curb back the Korean numbers by a decent amount in grading Thames' potential 2017 impact and so he should only be a late-round mystery pick in all leagues. It would be a futile overall attempt by the Miami Marlins to try and replace deceased ace starting pitcher Jose Fernandez but the team must try their best in shoring up what going into the winter was among their biggest weaknesses. On that front, the Marlins began that process by signing free agent veteran arm Edinson Volquez to a two-year deal worth $22 million. Volquez is coming off a terrible 2016 campaign where he pitched to a 5.37 ERA with the Kansas City Royals in the American League last season; a year that showed him pitching with a decreased fastball velocity and increasing struggles to strike batters out (just 139 whiffs in 189.1 innings). Moving back to the NL at the very least will help Volquez regain some of his lost K's but his years as even a 170-K guy are long in the past. In addition, at the age of 33, Volquez is pretty much a shell of the former SP 4 he was with the Cincinnati Reds and Pittsburgh Pirates. Yes the ballpark is spacious and facing opposing pitchers will be a bonus but Volquez is nothing but an SP 5 in mixed leagues and only slightly more valuable in NL-only formats this season. Week 12 is in the books in fantasy football as the Eagles and Packers put the finishing touches on things. Let's see what came out of it from a fantasy angle. -Aaron Rodgers has been a bit disturbing this season in that his overall performance has been as inconsistent as ever. As he creeps to his mid-30's, it is fair to wonder if Rodgers is slipping some. There was no such talk Monday night though as Rodgers completed 30-of-39 passes for 313 yards with 2 touchdowns. Obviously Rodgers' owners need more of this to win in the fantasy football playoffs but this is nice timing. -Davante Adams is really starting to make a name for himself as the expense of Randall Cobb in the Packers' passing offense as he caught 5 passes for 113 yards and 2 touchdowns. While he is still behind Jordy Nelson and Cobb technically as a starter, Adams is showing he might now be the best wideout on the team. -Nelson did his part as he caught 8 passes for 91 yards. It has been a bit of a slow comeback for Nelson at times this season but hopefully he too has saved his best for last. The jury is still out on whether he can return to elite WR 1 form which has not happened this season. -Those who took a chance on Wendell Smallwood Monday night were letdown as he rushed for 37 yards on 9 carries, while catching just one pass for another 10 yards. The fact Darren Sproles played really hurt Smallwood and there is simply no reason to try this again next week. -Carson Wentz has been impressive this season for a rookie but he was not good Monday night as he completed 24-of36 throws for 254 yards with 0 scores and 1 INT. This is typical stuff of a rookie however and you shouldn't have been using Wentz anyways in fantasy football this season. The latest report concerning Minnesota Vikings recovering running back Adrian Peterson remain murky as he is still not cleared to run and is only jogging at around 30 percent. This puts cold water on the recent wise guy moves in many fantasy football leagues where Peterson was picked up off waivers due to some recent reports that he may be able to return for Week 15 and thus help in the playoff weeks. The fact Peterson is still not yet cleared to run means Week 15 is unlikely to happen and Week 16 would be a longshot as well. Even if Peterson were to return for Week 16, he would likely be in a timeshare with Jerrick McKinnon after so much missed time and that can't be acceptable in a fantasy football Super Bowl matchup. Alas Peterson can be dropped if you were one of those who snagged him recently hoping for a miracle boost. As always lots of fantasy football injury news and notes to go around as we put a wrap on Week 12 tonight. Let's get to it. -Despite coming off a 10-catch/2-TD monster performance where he came back from a third degree shoulder separation, Washington Redskins tight end Jordan Reed is at best 50/50 to play in Week 13. Reed himself said as much as he couldn't say for sure what he will be able to do in terms of getting ready to suit up. He clearly got by on adrenaline on Thanksgiving as a third degree separation is a major deal. At least Reed will get a couple of extra days to recover given the Thursday game but line up Vernon Davis as a replacement just in case. -Minnesota Vikings QB Sam Bradford was limited in practice on Monday with a sore ankle suffered in Thanksgiving's loss to the Detroit Lions but he is fully expected to go this Thursday versus the Dallas Cowboys in a huge matchup for the team flickering playoff hopes. Bradford openly lobbied for the offense to open up more and that could be in play this week as that is the strong-armed QB's strength. After a great start with the Vikes, Bradford has reverted back to his career-long inconsistency the last few weeks and his fantasy football value is almost nil. -Indianapolis Colts QB Andrew Luck returned to practice on Monday after missing the team's Thanksgiving day loss to the Pittsburgh Steelers. Luck is having a good but not great season in terms of fantasy football but he should absolutely be started from here on out. -It seems a dislocated finger is the new en vogue injury in the NFL as Arizona Cardinals running back David Johnson suffered one Sunday in the team's loss to the Atlanta Falcons. Johnson played through it though and he won't need surgery like counterpart LeSean McCoy needed last Monday. He is coming off a monster game against the Falcons and is right there as fantasy football MVP this season. -New Orleans Saints head coach Sean Payton blamed the Los Angeles Rams coverages on defense for wideout Brandin Cook's unfathomable shutout in the passing game Sunday despite the team scoring 49 points. Count on Payton remedying that situation this week but the fact of the matter is that rookie Michael Thomas is clearly the closest the offense comes to being a go-to-guy. -It will be another missed game for Cincinnati Bengals wideout A.J. Green in Week 13 as he continues to recover from a severe hamstring injury. Week 14 is more likely but still Week 15 seems like the safest bet. -Ryan Fitzpatrick will start again for the New York Jets in Week 14 and that at least is better for those who own Brandon Marshall and Quincy Enunwa. -It looks like Lamar Miller escaped serious injury Sunday despite hobbling off with an ankle problem late in the team's loss to the San Diego Chargers. Miller is having a poor season despite huge expectation heading into the year but at least he will get more heavy usage while he is in there. -The Atlanta Falcons have unveiled a new offensive toy during the second half of the season in speedster Taylor Gabriel who went out and caught 4 passes for 75 yards and two touchdowns in the team's win over the Arizona Cardinals. Gabriel's development will only continue the monster season for QB Matt Ryan and the effort helped bury the Cardinals from playoff contention. -Despite being less than a week from thumb surgery, nothing could stop Buffalo Bills running back LeSean McCoy as he rushed for 103 yards and 2 touchdowns on just 19 carries, while also catching 2 passes for 31 more yards. While McCoy is not the elite receiver he once was, his rushing game has been as potent as ever and in actuality he is having a monster season on that front with 9 scores on the ground. He is a firm top five running back in all leagues. -Even in defeat Cardinals running back David Johnson is ridiculous as he rushed for 58 yards on 13 carries, while also catching 8 passes for 103 yards and a score. Anyone who picked Johnson number 1 overall clearly made a great choice. -It was a typical Sammy Watkins game upon his return to active duty on Sunday as he caught 3 passes for 80 yards for the Bills in their game versus the Jacksonville Jaguars. Watkins remains a guy capable of huge production but injuries and inconsistent QB play by the Bills have always held him back. It looks like that hasn't changed. -The end is near for San Diego Chargers tight end Antonio Gates who failed to catch even one pass in the team's Sunday victory over the Houston Texans. Gates stayed a year too long by the looks of it and he should not be on any fantasy football team. -How on earth is it that the New Orleans Saints score 49 points on offense but wideout Brandin Cooks failed to even catch one pass? We all know the Saints passing offense and QB Drew Brees spread the ball around but that is ridiculous and beyond infuriating for Cooks' owners. He is as streaky as they come and is tough to trust week-to-week. -Speaking of Brees, he was pure insanity Sunday as he completed 28-of-36 passes for 310 yards with 4 TD. Brees also added a rushing score for good measure and he put up over 40 points in a standard league. While he is aging at 38, Brees is in the same boat as Tom Brady in terms of not showing any signs of slowing down and remaining as dominant a passer as there is in football. I drafted him in the third round this past summer in the Experts League and have been more than happy with the production. -Enough of Tim Hightower as Mark Ingram was tremendous for the second time in three weeks as he rumbled for 146 yards and a score on 14 carries, while adding a second score on his 1 catch for 21 more yards. He can't be graded as more than a RB 2 with Hightower continuing to get work but Sean Payton needs to ends this garbage setup. -Devonta Freeman had been MIA for a few weeks like he did in the middle of last season but he re-appeared Sunday by rushing for 60 yards and 2 scores on just 16 carries in the team's win over the Arizona Cardinals. Freeman also caught 2 passes for 17 more yards. Tevin Coleman scored a touchdown of his own and their timeshare makes both RB 2's the rest of the season if both are healthy. -Michael Thomas looks like a real winner as a 2016 draft pick by the Saints as he rookie was terrific again on Sunday as he caught 9 passes for 108 yards and 2 scores. With Brandin Cooks completely out of sync with Drew Brees, you can say that Thomas is the number 1 wideout for the team which is a big statement. -It looks like all of the heavy usage Lamar Miller undertook in September for the Houston Texans is taking its tool as he limped off for the second time in three games with an ankle injury late in the team's loss to the San Diego Chargers. Prior to the injury, Miller was so-so again running the football as he rushed for 57 meaningless yards on 19 carries, while also catching just 3 passes for 18 more yards, Nothing has gone right especially lately for Miller and overall his mid-first round grade this season looks like a huge reach. -For the seventh time in the last 8 games, Tennessee Titans QB Marcus Mariota threw at least 2 touchdown passes as he completed 15-of-23 throws for 226 yards and the 2 scores. He also rushed for 46 yards on the ground as a bonus. The bottom line is that Mariota is right there as a top five overall fantasy football QB and the evidence is in the numbers. What a season he is having. -Jeremy Hill owners got to finally see what life would be like without Gio Bernard stealing touches as the power back rushed for 21 yards on 12 carries, while also catching 6 passes for 61 more yards. Rex Burkhead got some looks but this was the Hill show. On the rushing side, Hill was abysmal but at least he showed he can help in the passing game. -Those looking for some tight end help could look at Cardinals veteran Jermaine Gresham who caught five balls for 35 yards and a touchdown in the team's loss to the Falcons. While you really want to do better, Gresham has moved himself more and more into Carson Palmer's passing plans. -Once again San Francisco 49ers QB Colin Kaepernick is showing he is a good fit in Chip Kelly's offense as he completed 29-of-46 passes for 296 yards with 3 TD and 1 INT. He also added 113 rushing yards on 10 carries as he filled up the game score. With Kaepernick getting the starts the rest of the way, he has decent fantasy football value in all leagues. -While he scared us with an early thumb injury that turned out to not be anything worrisome, new York Giants wideout Odell Beckham Jr. had a big game as he caught 6 balls for 96 yards and 2 scores. Beckham is really picking up the TD pace during the second half of the season and is performing every bit as the top three overall wideout he entered the season as. -As expected Tyler Eifert was a high target receiver of QB Andy Dalton in the first game without injured wideout A.J. Green. Eifert caught 5 passes for 68 yards and a touchdown as he once again remains a huge TD threat at the very least. -Although not as extreme a case as Brandin Cooks in terms of the points scored by the team, it was still very disappointing for New York Giants rookie wideout to not catch one pass in the team's win over the Cleveland Browns. Shepard has had a big debut season but this is obviously one to forget. Keep playing him as a WR 3 despite the ugly game. -Well it is a start. Such was the performance from Los Angeles Rams rookie QB Jared Goff who completed 20-of-32 passes for 214 with 3 TD's. He also tossed an INT and lost a fumble which shows his rookie tendencies. While far from useful in fantasy football, at least it is something to build on for the kid. -Jordan Howard has been terrific as a rookie runner for the Chicago Bears since taking over for Jeremy Langford and he had another big game Sunday as he rushed for 84 yards on 18 carries, while also catching 3 passes for another 43 yards. He has been a tremendous mid-season value pickup and deserves top RB 2 consideration the rest of the season. -Slowly but surely Kenneth Dixon is gaining more and more work in the Baltimore Ravens backfield as he ran for 49 yards on 13 carries, while also catching 4 passes for 31 more yards. While still splitting time with Terrance West, Dixon is getting close to RB 2 status in PPR formats. -Yes that was Torrey Smith catching a TD pass for the 49ers Sunday as the invisible wideout snagged 3 passes for 24 yards and the score in the team's loss to the Miami Dolphins. We have always made it a point to knock Smith for his underwhelming performances going back to his Ravens days and now he is not even worth owing. -Just like with Marcus Mariota, Tampa Bay Buccaneers QB Jameis Winston is making a sizable leap in his second year in the league, with his recent play showing such a jump. The latest was Winston completing 21-of-28 passes for 220 yards with 2 TD and 1 INT in upsetting the Seattle Seahawks. While Mariota has been the better player this season, Winston has been no slouch and is showing he can be depended on as an every week fantasy football passer. -It was a ghastly outing for Seattle Seahawks QB Russell Wilson who completed 17-of-33 passes for 151 yards with 0 TD's and 2 INT's. He did rush for 80 yards on 8 carries but overall Wilson was a big dud. This ended a recent uptick swing for Wilson but he is still secure enough as a top 12-fantasy football QB. -It was a valiant comeback attempt by the Carolina Panthers but it fell short as QB Cam Newton did all he could in completing 14-of-29 passes for 246 yards with 2 TD and 1 INT. He also contributed a third TD on 6 rushing yards but Newton also lost a last-second fumble that clearly eliminated hem from playoff contention. The encore to his 2015 MVP has not been as good but Newton is still doing more than enough to justify his first round grade. -Helping along in the Carolina comeback that came up short was running back Jonathan Stewart who rushed for 96 yards and two scores on just 17 carries. The touchdowns are beginning to add up lately for Stewart who has made a career straddling 2/3 range but while he is hot, keep trotting him out there. -What a game for and what a season for that matter when it comes to Tampa Bay Buc's wideout Mike Evans. Evans caught 2 first quarter TD's Sunday in the team's win over the Seattle Seahawks and overall hauled in 8 passes for 104 yards. Nothing has stopped Evans this season and he fully has climbed into top tier status in all fantasy football leagues. -Malcom Mitchell has become the latest New England Patriots receiving weapon as he had a second straight good game for the team Sunday as he grabbed 5 passes for 42 yards and 2 scores. Mitchell has taken advantage of his increased chances to contribute and is placing himself in WR 3 range. Arizona Cardinals wideout John Brown is done early with a hamstring injury suffered in the second half of the team's game versus the Atlanta Falcons. Analysis: Brown has been an utter disaster this season and his fantasy football value can't get any lower. He should have been cut weeks ago anyways as he has not been in any way productive. Jacksonville Jaguars running back Chris Ivory was forced out of the team's game Sunday against the Buffalo Bills in the second quarter after suffering a hamstring injury. He is unlikely to return and will be replaced by T.J. Yeldon as the starting back. Analysis: It never ends with this guy in terms of injuries. Ivory was having a big day with 55 rushing yards and a score in the bank already but now he is done early. This is why you can never count on the guy as anything more than a low-end RB 2 in fantasy football terms. Updating an earlier item, New York Giants ace wideout Odell Beckham Jr. returned from the locker room and back onto the field after getting testing done on his inured thumb. Analysis: Wow that was quick and positive news all around. Obviously no breaks were found and that is all that matters. Exhale Beckham owners. New York Giants wideout Odell Beckham Jr. went back to the locker room after suffering an apparent thumb injury in the second quarter versus the Cleveland Browns. Beckham is undergoing X-rays to determine if there are any breaks and is questionable to return. Analysis: Oh boy. Any break means Beckham could be out weeks so this is a major news item. Hope for the best and prepare for the worst as always. Stay tuned. Here are the fantasy football QB rankings for Week 12 based on opposing matchups. Oakland Raiders wideout Michael Crabtree will START Sunday despite being listed as questionable with a sore ankle. Analysis: Crabtree has been passed fully now by Amari Cooper in the Oakland wide receiver hierarchy after the opposite was true in September and October. He still remains a potent TD threat in the red zone however and should be started in all formats. New Orleans Saints running back Mark Ingram has cleared the NFL's concussion protocol and will be active Sunday versus the Los Angeles Rams. He will once again split time with Tim Hightower however. Analysis: Ingram can't be graded as more than a low-end RB 2 given the timeshare and Hightower is a huge thorn in his fantasy football owners' sides. Overall Ingram has been a colossal disappointment this season and nowhere near the second round grade he had this past summer. New England Patriots QB Tom Brady will START Sunday against the New York Jets despite dealing with swelling in his knee during the past week. Brady was listed as questionable but he returned to practice on Thursday. Analysis: As if we ever really thought Brady was going to sit. He has been every bit the monster we expected him to be this season and should dominate against the weak Jets secondary. In a bit of a shock, New England Patriots tight end Rob Gronkowski will be active and START Sunday versus the New York Jets. Gronkowski was questionable with a chest/lung injury that caused him to miss last week's game but the limited practice time he put in the past few days was enough to get him the green light from the coaching staff. Analysis: Great news for Gronk owners who once again have had to endure a slew of injuries and missed games this season as always. He dominates when on the field though and will likely get his usual TD and near-100 yards against a Jets defense that is susceptible to the pass. Buffalo Bills wideout Sammy Watkins will make his return to active duty Sunday against the Jacksonville Jaguars from his ongoing foot problems. Watkins will start and is not going to be under any snap restrictions. Analysis: Same story as always with Watkins: supreme physical talent who is undermined yearly by injuries and awful QB play on his team. He gets a plush return assignment against the awful Jaguars defense though so get him back in there as your WR 3. Buffalo Bills running back LeSean McCoy will START Sunday against the Jacksonville Jaguars less than a week after having surgery on his dislocated thumb. Analysis: This is what was being said all week so no surprise here and it is obviously big news for McCoy's fantasy football owners. He has been beset by injuries the last month which includes a missed game but McCoy has been a top five overall running back in between. He should have a huge game against the sieve-like Jaguars defense. It is starting to look like former top pitching prospect Taijuan Walker is never going to live up to the hype that enveloped him while coming up the team’s minor league system. Classified as a power pitcher who was capable of major strikeout totals, Walker has battled ongoing shoulder trouble that seem to have taken some bite out of his stuff since arriving in Seattle. In 134.1 innings last season, Walker put up a 4.22 ERA but that number should have been even worse since he received a lot of BABIP luck at .267. When you adjust Walker’s ERA based on the lucky BABIP, his FIP shoots up to 4.99 which is waiver wire territory. Even more bothersome is the fact that despite calling a spacious ballpark home in Safeco Field, Walker’s HR/9 rate of 1.81 was among the highest in all of baseball. On the plus side, Walker is still very young at the age of 24 and his 7.97 K/9 has some room to grow if his shoulder stays healthy. We have seen plenty of post-hype sleepers like this eventually break through and so Walker should be given another chance as an SP 5 that could outperform his draft slot by a decent margin if all breaks right. Keep in mind though that his trade from Seattle to Arizona puts him in a big power park which makes his already high home run rate a major concern. FANTASY FOOTBALL WEEK 12 INJURY REPORT: GRONK TO SIT AGAIN, WHERE HAVE WE HEARD THAT BEFORE? Tom Brady: There is no way Brady is not going to be out on the field despite being listed as questionable with a knee injury. Yes Brady has missed practice time but that is because he is 39 and not because he is hurting. Put him in there and don't worry. Latavius Murray: Murray is dealing with an ankle injury but he will be in there according to multiple reports. Once again Murray has been productive but in a very understated way. He remains a firm RB 2 on workload alone. Mark Ingram: Yes Ingram has been doing work in practice but he still is not yet cleared in terms of the NFL's concussion protocol. He is also in a strict timeshare with Sean Payton's pet Tim Hightower so Ingram would be nothing more than a RB 2 anyways. Chris Hogan: Malcolm Mitchell owners are hoping Hogan sits out another game with his ongoing back woes as the latter was very productive in his place last week. Hogan is unlikely to play as he has done almost nothing in practice this past week and so Mitchell looks like a prime WR 3 play once again. Rob Gronkowski: It will mark the second straight game Gronk will have missed with the chest/lung injury he suffered in Week 10. Also it adds on to the missed games Gronk began the year with as he once again reminds us how fragile he is and how much of a draft risk he remains. Ryan Mathews: Injuries are nothing new for Ryan Mathews who has made a career out of them. This time it is an MCL injury in his knee that will likely keep Mathews out a few games. Also Darren Sproles has a rib injury of his own which means rookie Wendell Smallwood could be a huge value play this week. Jeremy Maclin: Maclin will sit for the third straight game with a groin injury and so Tyreek Hill gets a shot to be a WR 3 in PPR formats. Also look for a big game out of tight end Travis Kelce. The Thanksgiving Holiday delayed things a bit but let's delve into the Tuesday blockbuster trade between the Arizona Diamondbacks and Seattle Mariners centering on pitcher Taijuan Walker and shortstop/second baseman Jean Segura. Overall, the Mariners swap Walker, and shortstop Ketel Marte for a package highlighted by Segura, outfielder Mitch Haiger,and lefty Zach Curtis. Obviously Walker and Segura are the main chips so let's get into each. Taijuan Walker: Still just 24, Walker gets a new start in Arizona after enduring ongoing shoulder trouble and overall disappointing numbers with the Mariners. Considered one of the best power arm pitching prospects in the game while coming up, Walker has pitched to ugly 4.56 and 4.22 ERA's the last two seasons with the Mariners. A lot of Walker's progress has been interrupted by a few bouts with shoulder trouble and that alone is a monstrous red flag for a pitcher since problems there tend to erode stuff and fastballs. On that front, Walker did see a drop in his strikeouts last season as he whiffed just 119 batters in 134.1 innings (7.97 K/9 rate). Walker continues to struggle with the long ball (sky-high 1.81 HR/9) which is especially troubling considering he will now call the launching pad that is Chase Field home. While Walker has improved his control and still retains potential as a strikeout pitcher, the fact of the matter is that his move to Arizona will hurt him more with the long ball then it will help him when it comes to the likely boost in his strikeout total. Draft only as a low-end SP 4 with some slight upside. Jean Segura: The D-Backs think they might be selling high here but we are not liking the swap from their end. It is understandable they would be looking for cheap pitching though after whiffing both on Zack Greinke and Shelby Miller last season and Walker fits that bill at least. As far as Segura is concerned, he had a career-year in Arizona last season (his first there after coming over in a trade from Milwaukee) when he hit .319 with 20 home runs and stole 33 bags. This came after Segura seemed like a 2013 one-year wonder when he struggled the following two seasons. Unfortunately for Segura, he moves to a more spacious park in Seattle that will chip a few home runs from his 2016 total but he also should still run like crazy on a team that is looking for speed. Alas Segura won't hit .319 again either as he is more of a .290 guy and his move back to shortstop could hurt his offensive numbers a bit again as struggles there with Milwaukee was said to have hurt his hitting. Downgrade Segura slightly but not too much since he retains decent value both at second base and at shortstop. Ketel Marte: Marte is somewhat interesting now moving to Arizona because he is in the same position as Segura prior to 2016 as a reclamation project moving into a top hitting ballpark. The guy has speed to burn, is still young, and has power that is developing. Not the worst way to spend a late round upside pick this season. It was an absolute roller coaster ride for those fantasy football owners of Washington Redskins tight end Jordan Reed on Thanksgiving. First Reed suffers a shoulder injury in the second quarter that sent him to the locker room as reminders of how fragile and injury-prone the guy has been throughout his career came back into the forefront of our memories. Then Reed returned and went all Tony Gonzalez on the Dallas Cowboys as he caught 10 balls and 2 touchdown passes from QB Kirk Cousins. Alas postgame testing on Reed's shoulder showed a Grade 3 separation which means ligament damage and a complete separation out of the joint. There are two ways to look at this of course, with the first being that playing on Thursday will allow Reed some extra time to possibly play in Week 13. However such a serious shoulder injury is more likely to keep Reed out and so his fantasy football owners should already plan on picking up Vernon Davis off waivers. Davis has played well as a backup to Reed this season and the Redskins love throwing the football all game long so he is about the best possible replacement you can find on the wire. Made the play for Davis and hope this is just a one-game loss at most. With Reed though you can never be too sure. -In what became a very boring game with not a lot of points, Detroit Lions QB Matthew Stafford was so-so against a tough Minnesota Vikings defense as he completed 23-of-40 throws for 232 yards and a touchdown. Stafford has been way too much up-and-down over the last month or so and that makes it somewhat tough to rely on him going into the fantasy football playoffs. -The weekly fantasy football wrapup should be renamed the Ezekiel Elliott wrapup as the Dallas Cowboys rookie back sensation has been a staple here since Week 3. It was mor eof the same Thursday as Elliott rushed for 97 yards and 2 touchdowns on 20 carries, while also catching 2 passes for 23 more yards. This is the best rookie back in the NFL since Adrian Peterson's arrival and needless to say his mid-first round grade has been well worth it. -Once again we remind you all how we were big fans of Washington Redskins QB Kirk cousins heading into the 2016 season. Operating in a pass-first offense, Cousins has been tremendous for the second year in a row, with the latest highlight being his spectacular 449-yard masterpiece with 3 TD's against the Dallas Cowboys. For the game, Cousins completed a ridiculous 41-of-52 passes for the 449 yards with the 3 TD's and no INT's. This is a top tem fantasy football QB folks. -A big part of Kirk cousins' big day Thursday was the contributions of tight end Jordan Reed who caught 10 passes for 95 yards and two scores. Reed was hobbled throughout the game due to suffering an early AC joint injury in his shoulder but he gutted it out and came through with a monster game. He had been quiet for a number of weeks leading into the game which made Reed's outing a welcome development and his status as a top five fantasy TE remains firm. -Never a big fan of his due to the ultra-streaky results he brings to the fantasy football table, Redskins wideout Desean Jackson saw the performance meter pointed upward Thursday as he caught 4 passes for 118 yards and a touchdown. Again Jackson is way too up-and-down for our taste but he is in a big passing offense which makes him a decent WR 3. -Other then Ezekiel Elliott and David Johnson, there has not been a better back in fantasy football then the Pittsburgh Steelers' Le'Veon Bell. The running/receiving dynamo did his usual thing Thursday night in rushing for 120 yards and a touchdown on 23 carries, while also 4 passes for another 22 yards. All the nonsense aside, Bell is right there as the number 1 player in PPR formats as he already has 57 catches and is running as well as ever. -Antonio Brown played pitch-and-catch with Ben Roethlisberger Thursday night as he caught 5 passes for 91 yards and 3 touchdowns. While Julio Jones is having an excellent season, Brown has no peer when it comes to production at wide receiver and like with Le'Veon Bell, is there as the top guy in the game if you are in a PPR league. -Speaking of Roethlisberger, he was an efficient 14-of-20 passing for 221 yards with 3 TD's and 0 INT's. When he is on the field, Big Ben is as slam-dunk to tier fantasy football QB no mater the setup. All along the consensus line of thinking has been that the New York Mets and free agent outfielder Yoenis Cespedes will eventually find common ground and reunite under a new deal. Initially the Mets reportedly wanted to keep things to a four-year deal worth around $25 million per but they apparently are now willing to go to a fifth year given the fact Cespedes is the biggest hitting fish on the market and that the price dictates such a move. Cespedes has told anyone who would listen that he wants to return to the Mets and no team has jumped heavily to the forefront yet as challengers. Also a potential big fish in the New York Yankees reportedly don't have Cespedes in their plans. Thus is seems like an official reunion is only a matter of time form happening unless another team comes with some major bucks at the winter meetings to muddle things. -Speaking of the Yankees, GM Brian Cashman told NY-area reporters that he has heard all the talk about closer Aroldis Chapman wanting to return to the team but that he said it will come down to dollars like it always does. On that front, Chapman is expected to be the first closer to net a $100-million contract but he too told Yankees confidant Ray Negron that he wants to come back to the team given how well he was treated during his short stint there last season. Another indication this is likely going to become official is that the Los Angeles Dodgers have increased their talks with Kenley Jansen and Mark Melancon which indicates possible they think they are out. Just to show you how barren the catching market is this winter, the Minnesota Twins just inked veteran catcher Jason Castro to a three-year deal worth $24.5 million. The same Jason Castro who hit just .210 in falling completely out of favor in Houston last season, while also striking out 123 times in just 329 at-bats. Still just 29 (turning 30 in June), Castro will be the guy the Twins look to stabilize the catcher position on the team after Joe Mauer was moved to first base a few years ago. Needless to say, Castro's signing does not move the needle much at all in terms of 2017 fantasy baseball and really we are talking about just a low-end guy in two catcher formats or at most an AL-only starter. While Castro does have power (43 home run the last three seasons), his ridiculous annual K/9 rates make him a major batting average liability and his move to spacious Target Field could also hurt the power some. At most what we are looking at here is a guy who can hit 15 home runs, drive in 60, and bat around .240. You can do better. What on earth? Who knew that instead of drafting Carlos Correa in the first round in 2016, you could have gone with Jonathan Villar off the waiver wire instead and ended up with the much better statistical season. The fact you would have likely been kicked out of your league for taking Villar even as high as Round 8 last season tells you how unexpected his insane five-category bonanza season was. Previously a failed Houston Astros prospect who batted just .243 and .209 his first two years in the majors, the light bulb for Villar seemed to go off in 2015 while he was playing for the team’s Triple-A affiliate. It wasn’t until Villar got a much-needed fresh start with the Milwaukee Brewers (after coming over via trade) for the 2016 season that the speedster’s full potential began to manifest itself. The rest as they say is history as Villar went nuts to the tune of setting career-highs in all five standard league categories. Operating out of the team’s leadoff spot, Villar batted .285, scored 92 runs, and ran all year long to the tune of an MLB-leading 62 stolen bases. Perhaps the most shocking development of all was the fact Villar smacked 19 home runs and collected 63 RBI. Considering that from 2013-15, Villar hit a TOTAL of 26 home runs between the minors and majors, one can see just how spectacular a feat that was. While it may be tough to believe in the totality of his numbers, Villar’s massive speed should never be debated and his pure hitting skills have really come along from his Astros days when you see a BB/9 rate last season of 11.6. With Villar waiting for his pitch like never before, the hits began piling up and the average went northward. Now as far as the power is concerned, yes it might be tough to buy into 19 home runs again but keep in mind last season that Villar was just starting to reach his prime at the age of 25. He won’t turn 26 until this May and so Villar is now just getting into his optimum power years. Yes it would be a better idea to expect 15 home runs this season and to consider anything more than that a nice bonus but the total package of Villar is beyond impressive. We are on the side that says Villar is a legit talent who should be picked during the initial first five rounds of your draft. Fantasy football Week 11 is now in the books as the Oakland Raiders and Houston Texans met in Mexico. Let's check out the storylines emanating from the game. -Texans rookie wideout Braxton Miller is becoming more and more of a factor in the team's passing game as the season has gone along, at the expense of fellow rookie Will Fuller who can't seem to kick the injuries. He started opposite of DeAndre Hopkins and caught five passes for 25 yards and a touchdown. The former Ohio State QB has speed to burn and is becoming at least someone to monitor for another week. -After performing like an All-Pro the first two months of the season, Raiders wideout Michael Crabree has struggled in November, lowlighted by catching just three passes for 5 yards. The touchdowns have dried up a bit for Crabtree as well but he remains a firm WR 2 in all leagues. -It has been a tough go of it both for Texans RB Lamar Miller and his fantasy football owners as 8 men in the opposing box have bottled up the first round pick all season. Still Miller showed burst Monday night as he rushed for 104 yards and a score on 24 carries, while also catching 2 passes for 9 yards. Overall though the numbers are well below expectations for Miller and those who spent a mid-first round pick on the guy. -Raiders QB Derek Carr has shown no letup in his monster Pro Bowl 2016, completing 21-of-31 passes for 295 yards with 3 TD and 1 INT Monday night against a tough Texans defense. Carr has been terrific from Week 1 and has firmly established himself as a top tier fantasy football QB. Indianapolis Colts QB Andrew Luck is unlikely to be cleared in time to start against the Pittsburgh Steelers in the annual late-game Thanksgiving Day special and his loss reverberates to a wide spectrum for a number of reasons. Obviously Luck's fantasy football owners lose out big-time in such a big matchup against an awful Steelers defense. On a secondary front, Luck's loss is a big blow to all of us who were looking forward to a great on paper matchup between the Colts and Steelers. That is obviously fallen by the wayside as Tolzien is a career backup for a reason and the Steelers likely will blow the Colts out as a result. Also the Indy skill position players are going to see their numbers ebb a bit as well due to Luck's absence. Pretty much everyone loses with Luck being out both in real and in fantasy football. When Buffalo Bills running back LeSean McCoy failed to come out for the second half of the team's win over the Cincinnati Bengals, rumors began to swirl about how serious the thumb injury he suffered in the first half was. Talk of a bad break or ligament damage made the rounds but eventually it was revealed that McCoy suffered a dislocation, which the trainers had a tough time putting back into place. A quick surgical procedure was done on McCoy's thumb early on Monday but both he and the team said he should be ready to go for Week 12. That is great news of course for McCoy and his fantasy football owners and it is now up to the veteran to reverse what has been a rough November after he went crazy in September and October with some huge numbers. Be that as it may, McCoy has dodged two close calls now with injuries this season and that is the number 1 storyline this week. For now, keep putting McCoy in the lineup on a weekly basis as he has the workload and ability to produce like a RB 1 like we have seen. -Despite not being 100 percent healthy due to a balky back, Dallas Cowboys wideout Dez Bryant dominated Jimmy Smith of the Baltimore Ravens by catching 6 passes for 80 yards and 2 scores. Bryant once again is doing his heavy-TD thing and the amazing success of rookie QB Dak Prescott has saved his fantasy football season after things looked dicey once Tony Romo went out. -As if we didn't already know that Dak Prescott was special, the rookie Dallas Cowboys QB went out and completed 27-of-36 passes for 301 yards and 3 touchdowns in the team's win over the Baltimore Ravens. We are really seeing something rare here in terms of a rookie passer showing such poise and playing such mistake-free football as Prescott has. He was picked in the very last round of the Experts League draft this past summer and needless to say has been an insane value that has not as rare as can be. -Jacksonville Jaguars running back Chris Ivory got almost the full allotment of work in team's backfield Sunday after T.J. Yeldon went out injured. Ivory rushed for just 39 yards on 17 carries but he was big in the passing game as he hauled in 6 balls for 75 more yards. We started seeing Ivory become a more dependable receiver last year with the New York Jets and this game shows he is getting more and more capable there. If Yeldon sits next week, Ivory could be a very good RB 2. -It would be tough to imagine any Le'Veon Bell owners losing their matchup Sunday as the Pittsburgh Steelers monster running back went wild on the Cleveland Browns. Bell rushed for 146 yards and a touchdown on 28 carries, while also catching 8 passes for another 55 yards. There is not a better PPR back in all of fantasy football and even an overall back as well. While Bell has been a bit frustrating to own the last two years with his injuries and suspension, his production is insane. -Cincinnati Bengals tight end Tyler Eifert is back to full health and full usage by the team as he caught 3 balls for 37 yards. With A.J. Green having suffered a torn hamstring, Eifert is now set to get a huge amount of throws from QB Andy Dalton. His stock is set to rise sharply. -The recent PPR monster run for Minnesota Vikings slot wideout Stefon Diggs came to an end on Sunday as Arizona Cardinals CB Patrick Peterson completely shut him down to the tune of 6 catches for a meaningless 37 yards. Overall Diggs has been very good this season but his overall production has been more WR 2 then the WR 1 it looked like he may turn into back in September. -The disastrous season of Cardinals wideout John Brown continued on Sunday as the deep threat did not catch a single pass against the Vikings. It is crazy the gigantic step back Brown has taken this season after he looked on the verge of stardom after 2015 but he has not been worth using in fantasy football since October. He should not be on any roster at this point. -Cardinals QB Carson Palmer seems fully immersed in his "cliff season" where his career is going down the toilet after he was simply brutal again Sunday against the Vikings. Palmer was hit on a crazy 23 dropbacks and wound up completing just 20-of-38 passes for 198 yards with 2 TD and 2 INT. While he has had a nice career, Palmer has dragged down a good Cardinals team this season with his turnovers and awful play. He should have been cut weeks ago. -The only Cardinals offensive player who could hold his head up high Sunday was running back David Johnson who rushed for 103 yards on 22 carries with one touchdown. Johnson also caught 7 passes for another 55 yards and a second TD. Simply put, Johnson has been worth every penny as a top pick or top three guy which he was in most fantasy football leagues this season. -DeMarco Murray topped 1,000 rushing yards for the Tennessee Titans Sunday as he picked up 70 yards on 20 carries, while also catching 3 balls for another 9 yards and a score. Murray has been a scoring machine this season and also has been terrific in the run/receiving game. He remains in the running for being this season's fantasy football MVP. -Adam Thielen flashed again for the Vikings Sunday as he caught 5 passes for 65 yards and a touchdown against the Arizona Cardinals. Thielen's big game coincided with the fact Stefon Diggs was shut down by Patrick Peterson and overall he is still just a bench guy since the weekly results are not consistent enough. -It was just one start but Jared Goff was horrific in his NFL debut Sunday as the 2016 number 1 overall pick completed just 17-of-31 passes for 134 yards with 0 TD's and no INT's as the Los Angeles Rams somehow coughed up a 10-0 lead in the last four minutes of the game against the Miami Dolphins. Yes Goff deserves a leash as he works out the rookie kinks but we were not impressed with him in college as we stated in our yearly NFL Draft Guide. Jeff Fisher could find his job in serious jeopardy by the end of the season. -Seattle Seahawks QB Russell Wilson is getting hot at the right time after a somewhat rough first 8 weeks as he completed 18-of-31 passes for 272 yards and a TD, while also catching one pass for 15 yards and another score on gadget play. With the Seahawks getting decimated at running back like they did in 2015, Wilson will likely be turned more loose in the passing game the rest of the season which bodes well for his fantasy football numbers. -Doug Baldwin has really solidified himself as a top wideout in fantasy football in 2016, posting another dominant outing Sunday against the Philadelphia Eagles when he caught 4 passes for 104 yards, while also throwing a 15-yard TD toss to Russell Wilson. His 2015 second half was a sight to be seen but Baldwin has more than validated that breakout in 2016. -Thomas Rawls was back in the saddle finally Sunday as he made his debut alongside rookie speedster C.J. Prosise. By the end of the game, Rawls was the bellcow back as Prosise suffered a scapula injury. With regards to his numbers, Rawls rushed for 57 yards on 14 carries, while also catching 3 passes for another 31. With Prosise likely out for the rest of 2016, Rawls will be a major standard league guy the rest of the way. -DeVante Parker has really had a nice sophomore season in 2016 in showcasing big-play ability and a knack for getting open. He did more of the same Sunday as he caught 8 passes for 79 yards and TD in the Miami Dolphins' comeback victory over the St. Louis Rams. Parker is on the verge of graduating into WR 1 territory with some more seasoning as outings like we saw on Sunday are becoming his standard production. Week 11 was one of those disaster injury weeks when it came to big name players as LeSean McCoy, Zach Miller, and A.J. Green all went down with various maladies. Green's was the worst so far as the Cincinnati Bengals ace wideout suffered a torn hamstring early in the team's loss to the Buffalo Bills, an injury so severe that he ha to be carted off the field. Thus the diagnosis of the tear was no shock and the fallout is big for Green's fantasy football owners as he very well could be done for 2016. At the very least, Green should be out for the remainder of the fantasy football season which goes through Week 16 and so his top five wideout numbers this year leave a gigantic hole in his owners' lineups. Flat out, a loss like Green can't be made up and his injury is the type that sinks seasons. The fallout in terms of who picks up the slack centers of Tyler Boyd and tight end Tyler Eifert. Eifert will get a ridiculous amount of throws from QB Andy Dalton going forward and Boyd should be the top waiver add this week on his opportunity alone. As far as Green is concerned, hold him for another day to see if he is in fact out for the year but we likely have seen the last of him until 2017. Updating an earlier item, Buffalo Bills running back LeSean McCoy suffered a dislocated thumb Sunday against the Cincinnati Bengals which knocked him out of the game in the first half. McCoy will have further testing on Monday to see how long he could be out. Analysis: Not sure why McCoy couldn't return but reports indicate the Bills training staff couldn't get the thumb to slide back in. His status for Week 12 is too early to call but a dislocation doesn't on the surface seem like a major deal. A sigh of relief might be in order but let's get more clarity on it first. There are rumblings that Buffalo Bills running back LeSean McCoy suffered a serious thumb injury that could result in a break or ligament damage after he was forced out of the Sunday's game against the Cincinnati Bengals. The fact McCoy was not able to simply wrap the thumb up and keep going was very telling and sheds some light that this is not a minor deal. After such a monster start to his 2016 season, McCoy has been nothing but a major injury liability of late which is undermining his early work. Cleveland Browns rookie QB Cody Kessler was forced out of the game Sunday versus the Pittsburgh Steelers early in the fourth quarter after taking a vicious hit to the upper chest area. He was replaced by veteran Josh McCown. Analysis: While Kessler has shown flashes of promise, one thing he is showing as a rookie is that his slight frame can't withstand consistent NFL pounding which is a big problem. Kessler has been forced out of a number of games this season already and this is more par for the course. Uh-oh. Fantasy football owners of Cincinnati Bengals wideout A.J. Green are facing a rough situation now as reports are emerging that the hamstring injury he suffered in Sunday's game against the Buffalo Bills is a serious one and that he could be out for a number of weeks. Green was in obvious pain after suffering the injury in the first half and he required a cart to leave the field which is always a dire sign A Grade 3 hamstring strain is usually a month absence and that is what Green and his fantasy football owners are looking at right now. Bump up Tyler Boyd as he will now be the number 1 guy in Green's absence and he should be a top waiver pickup this week. Buffalo Bills running back LeSean McCoy is done for the day Sunday after suffering an thumb injury the first half against the Cincinnati Bengals. Analysis: It has been a very rough stretch the last month in terms of injuries for McCoy who has missed a game with leg/knee trouble and now the thumb. No word on if the thumb is broken but McCoy's absence for the second half is huge. Dallas Cowboys All-Pro wideout Dez Bryant will be active and start versus the Baltimore Ravens despite dealing with a persistently sore back over the last week. Analysis: Bryant is no stranger to injury unfortunately and that has to be factored into his price tag in drafts moving forward and makes him a weekly scare guy in terms of getting hurt again. He had a tough matchup versus Jimmy Smith but Bryant seems to get his numbers on a weekly basis. Philadelphia Eagles ace wideout Jordan Matthews will be active and start Sunday versus the Seattle Seahawks despite being limited in practice this past week with a bad back. Analysis: Matthews has been good but not spectacular in a WR 2 sense. Think of a younger Jeremy Maclin type of guy but he will have a rough go of it at less than 100 percent Sunday going up against Richard Sherman. You may want to look at your bench to see if there are better alternatives this week. Here are the fantasy football running back Week 11 rankings based on opposing matchups. Once again the St. Louis Cardinals are concentrating heavily on pitching during the winter months which has been the strength of the team going back to when Dave Duncan was the best pitching coach in the game. The team bolstered the bullpen on Saturday by inking lefty reliever Brett Cecil to a four-year deal worth what could be up to $30 million. A failed closer but a top setup man previously with the Toronto Blue Jays, Cecil pitched to a 3.93 ERA, 1.28 WHIP, and struck out an impressive 45 batters in 36.2 innings. He has little to no fantasy baseball value however as Cecil will act as a lefty setup man in front of sudden star closer Seung-Hwan Oh. Many in the fantasy baseball community tend to have short-term memories when it comes to players and this is especially true if such a hitter or pitcher is young of age. Often a hot stretch of intriguing play followed by injury or an extended slump can quickly dull any fantasy baseball momentum that might have been building. This was such a scenario for Toronto Blue Jays second baseman Devon Travis over the last two seasons as he ran the gamut from being highly sought after to becoming waiver wire trash. Winning the second base job out of spring training 2015, Travis became an overnight sensation that April by hitting .325 with 6 home runs and 19 RBI in only 80 at-bats. It certainly looked like Travis was setting himself up to possibly be the next big thing at the always volatile second base position but then the calendar flipped to May which was when all the trouble began. A rough .189 performance that month was soon followed by a bout of shoulder soreness that eventually landed Travis on the DL. While he did make it back in July for a short 21-game stint, more shoulder pain sent Travis back to the DL for good and soon surgery was performed that offseason which prevented him from being ready at the start of 2016. After what seemed like endless waiting, Travis was activated from the DL in May and proceeded to go right back to hitting the baseball hard but with much less attention paid to his accomplishments. Batting .300 with 11 home runs in 432 at-bats, Travis showed his shoulder was sound and that he was ready to be a key contributor both for the Jays and his fantasy baseball owners. As far as the advanced numbers were concerned, Travis showed an overall nice approach at the dish, which has helped him hit for average at a still very young age (he won't turn 26 until February). A 20.1 K/9 rate looks just fine but Travis does need to show some more patience since he walked in just 4.6 percent of his at-bats last season. With age usually comes more patience and that will further solidify Travis as a decent average guy going into the future. Depending on where the Jays hit Travis this season, his counting numbers in runs and RBI should be helpful as well given how potent the lineup is. In terms of the power, we don't really know yet how high that ceiling goes but Travis has shown he can hit the baseball hard which makes 20 home runs not out of the question. Travis also possesses good speed but it has not translated yet on the base paths (just 4 steals in 2016). What should really be interesting about Travis for 2017 fantasy baseball is the fact no one is really talking about him since April 2015 is slipping out of the minds of many. That means a very good profit could be made here if you choose to go with Travis as your starting second baseman. Not even 24 hours after winning his second MVP award prior to the age of 27, Los Angeles Angels Mike Trout continues to hear his name thrown in on prospective trade chatter. The latest centers on the New York Yankees and GM Brian Cashman's recent stockpiling of uber-talented prospects over the last few months. From adding top shortstop prospect Gleyber Torres and outfielder Clint Frazier in the Aroldis Chapman/Andrew Miller deals to the two power arms they just got (Albert Abreu, Jorge Guzman) in the Brian McCann swat, there are certainly piece in place that could make a deal possible. In order to get Trout, it is a certainty that Cashman would have to give up Torres and Frazier plus James Kapereilien and Guzman. And something else would also needed as the Angels reportedly want five high-end prospects for the best player in baseball. While the Yanks have not commented on the rumors (there are tampering rules), they also are known to be enamored of a possible Trout deal. Meanwhile, the Yanks are beyond the initial stage when it comes to talking contract with free agent 1B/DH Edwin Encarnacion. The DH spot is now open on the Yankes after trading away McCann and Encarnacion would be a tremendous fit there in Yankee Stadium. If a deal can't be worked for Encarnacion, a reunion with Carlos Beltran would likely come together quickly. -It is looking more and more like Yoenis Cespedes will re-sign with the New York Mets but the only issue could be if he gets four or five years for $25 million per. Once Cespedes is in the fold, the Mets are expected to listen heavily to offers on Jay Bruce, Curtis Granderson, and even Michael Conforto. -Speaking of the Yankees, they have touched base on Cespedes but only in a "due dilligence" manner and they also would entertain bringing back Granderson in a possible trade given how well his power played there in past. -The Los Angeles Dodgers want to bring back Rich Hill but not go beyond two years. Hill is trying to cash in as this is clearly his last best chance at a big payday at the age of 37. -The Miami Marlins are obsessed with closer Kenley Jansen and are willing to pay the freight here as they have no confidence in A.J. Ramos. -The Atlanta Braves and Chris Sale rumors are really heating up and Jose Quintana could also be a fallback if the two sides can't agree on the ace starter. -Jose Bautista doesn't seem to be a priority for the Blue Jays with regard to re-signing the slugger and that is why they are now being connected to Dexter Fowler and Adam Eaton. After New York Yankees GM Brian Cashman traded away catcher Brian McCann to the Houston Astros on Thursday, the team all of a sudden had a sizable opening at their disposal in terms of the DH spot for 2017. Never one to sit tight on an obvious situation, the Yanks appear poised to reel in a big-catch replacement for McCann at DH as they reportedly are talking to the agents for Mark Trumbo and Edwin Encarnacion to fill that gap. Encarnacion in particular has become a major target of attention for Cashman as proposals were exchanged late Thursday night but nothing appears imminent. Still with the Boston Red Sox and Baltimore Orioles both in on Trumbo and Encarnacion, a signing there by the Yanks would be a big blow to their AL East rivals. Meanwhile the Yankees also are not discounting a reunion with Carlos Beltran but that will come only if they happen to lose out on Trumbo or Encarnacion. Heading into MLB's Hot Stove season, the status of New York Yankees veteran catcher Brian McCann was one of the major storylines heading into the winter. This was due to the smashing and historic debut of Yankees catching prospect Gary Sanchez who went all Babe Ruth on opposing pitchers in his two months in the majors. Sanchez' meteoric rise meant that the Yankees would give him the starting catching job entering into 2017, with McCann moving into backup status and manning the DH spot. Not ideal for McCann of course and that is why it was assumed Yanks GM Brian Cashman would eventually find a trading partner. Well it didn't take long as Cashman dealt McCann to the Houston Astros late Thursday for two minor league pitching prospects As a result of the trade, McCann will now be an everyday starting catcher once again and the moves saves his fantasy baseball optimal value for 2017. Already well established as a perennial top 5-7 fantasy baseball catcher, McCann should once again challenge 20 home runs, 70 RBI, and a batting average in the .240 range. While McCann's power has remained steady throughout his career, his batting average has been a liability for a number of years now and makes him just a two category asset in home rums in RBI. Grade McCann as a solid and proven fantasy baseball catcher again this season and realize that Evan Gattis remains eligible there as well for the Astros entering into 2017. 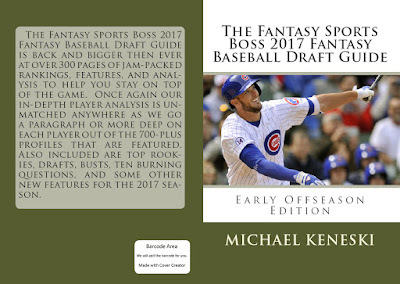 With the holidays quickly arriving, be sure to get your loved ones a brand new copy of The Fantasy Sports Boss 2017 Fantasy Baseball Draft Guide: Early Offseason Edition. The book is over 200 pages jam-packed with all the info you need to begin preparing for the upcoming season. It is updated through the free agents signings of Kendrys Morales, R.A. Dickey, and Bartolo Colon and makes for a great holiday gift. Use the BUY NOW tab below to purchase. At some point, a given offensive fantasy football sleeper runs out of chances to realize his potential. Such a timeline usually incorporates 2-3 seasons and if a breakthrough is not reached in that span, this player becomes largely dismissed by the fantasy community as a whole. We could very well be reaching that point now with Philadelphia Eagles tight end Zach Ertz who is currently battling a hamstring injury and who for the third season in a row is letting those down who drafted him thinking a breakthrough was imminent. The breakthrough hope was an understandable one as Ertz has shown flashes of big-time receiving ability but who ultimately has been a letdown as whole both in 2014, 2015, and now 2016. Expected to sit out Week 11 with the hammy, Ertz now sits with just 29 catche for 302 yards and 0 scores this season despite the fact the Eagles have gone with a rookie under center in Carson Wentz from the start. With rookie tight ends often looking to their tight ends as an outlet, Ertz' lack of production is even more shocking. So with Ertz now injured to go with a lack of receptions, it is no time to drop him in all formats and to stop hunting down potential that he just carry anymore. After tossing not one but TWO no-hitters in a spectacular 2015 campaign for the Washington Nationals, it was tough to imagine that Max Scherzer could top such a dominant season. Well Scherzer unveiled some new tricks in 2016 as he reached a new high with his already insane K/9 rate (11.19) and that led to another new career-best in strikeouts with 284. As the topper, Scherzer claimed his second Cy Young Award. While Scherzer has been widely considered the number 2 starting pitcher in fantasy baseball behind Clayton Kershaw for a few years now, the argument can be made that he passed his Los Angeles Dodgers counterpart based on possessing much better durability. While Kershaw missed half of last season with a herniated disk in his back, Scherzer pitched over 200 innings for the fourth year in a row. So far all of those innings have not hurt Scherzer but he did see a spike in his HR/9 (1.22) that was more of an issue the first half of the year. On the plus side, Scherzer has maintained terrific control with all of those strikeouts and his win total will remain very impressive considering he pitches for one of the best teams in baseball. There is simply nothing to say here that is remotely negative regarding Scherzer’s makeup and he is as safe an early round investment as one can make at this volatile position. While far from a proven commodity, there was more than a little bit of hype surrounding the arrival in Houston of free agent running back Lamar Miller last offseason. Freed from Miami where he was criminally underutilized despite hinting at big-time ability, Miller seemed to strike gold both in the bank account and with the opportunity in Houston with a Texans team that was searching for a bellcow back to ride throughout the season. Possessing both the ability to break big runs with above-average speed and also helping as a pass receiver out of the backfield, Miller almost overnight turned into a mid-first round pick in 2016 fantasy football drafts. With Bill O'Brien adding to the hype during training camp when he spoke about how much work Miller would get, visions of a fantasy football MVP campaign began to dance in his owners' heads. Fast forward to present time and what we have now is a hobbled and vastly disappointing Miller who has fallen way short of his massive preseason expectations. In fact Miller has been downright miserable at times, with both he and the Texans offense as a whole bearing some responsibility. As far as the numbers are concerned, Miller goes into Week 11 with 720 yards on the ground at a good but not great 4.3 per pop. Even more disappointing is the fact Miller has scored just two touchdowns on the year and also has not made much of a dent in the passing game with 22 catches for 124 yards and one score. Miller also has suffered some shoulder and leg/knee injuries over the last three weeks, which has given both Alfred Blue and the explosive Akeem Hunt up to half of the workload during that span. With Miller being so much of a letdown, Blue and Hunt's increased usage might be a sign O'Brien is looking for another solution at running back and that could be a huge hit to Miller's fantasy football outlook going forward. Ultimately what we get the sense of is that Miller is reprising his good but not great numbers during his years with the Dolphins despite all of the extra work he has gotten. Also it could be that Miller is starting to get banged up after the Texans ran him almost into the ground with a crazy workload in September. Finally, the awful play of QB Brock Osweiler has allowed opposing defenses to load up the box to stop Miller and so he can't be totally blamed for his shoddy numbers this season. Ultimately however, Miller has fallen well short of the mid-first round price tag he carried to say the least. Turning things around for the better doesn't look like it is a given either by the looks of things given what we have seen in Miller's recent work.